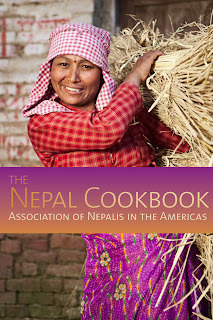 The Nepal Cookbook by the Association of Nepalis in the Americas is a wonderful collection of Nepali recipes contributed by various people to help the Association of Nepalis in the Americas with their goal of being an information resource to continuing tradition. The introduction includes the table of contents, the purpose of the Association of Nepalis in the Americas, a preface explains a bit of the food traditions and history of the region and a good special ingredients section to help you find those region specific ingredients. The special ingredients section also has a recipe to make your own garam masala from scratch. The recipes are wonderful. There aren't any full color photos, instead the focus is on the recipes. They are separated by food types; snacks and appetizers, soups and lentils, vegetables, meat dishes, chutney and pickles, rice and breads, and desserts. The recipes are mostly quick and easy to prepare, and a lot of them are very low cost. There are also a lot of very healthy recipes in here which make it a good choice for families like mine that are constantly busy but also really enjoy good food. The seasoning is what makes the food taste amazing and unique, there are a lot of spices and herbs used in the various recipes. Curry lovers will enjoy the range of curry recipes which include all the seasoning ingredients. If you've never made your own curry from scratch, you're in for a treat. These are in both the vegetables chapter and the meat chapters. So if your a vegan, or choose to eat vegetarian meals occasionally, you'll enjoy the seasoning of the cauliflower and potato curry. There is also a super easy egg curry in the meat section which makes a great fast lunch. My favorite chapter right now is the lentils chapter. I love soup anyway, and lately have really been loving lentils. The spicy spinach lentils are becoming a new favorite with all the flavors in them. The pickles are cooked, and best kept cold and fresh. The breads are unleavened and quick to make. My daughter of course went straight to desserts, then stunned all of us by deciding the recipe she wanted to make was for carrot fudge. We expected it would doughnuts or mango ice cream cones. She liked how that turned out, and wants to try almond fudge next. Published by Snow Lion Publications, a part of Shambhala Publications.